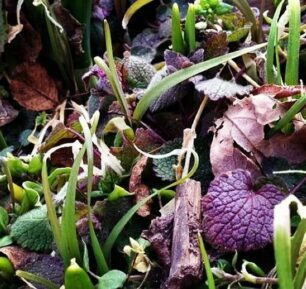 In early April I am so thankful I have planted Spring bulbs or the only flowers I would have been from the Dandilion blooming in my lawn. In this post, I share sweet spring garden blooms that arrive. 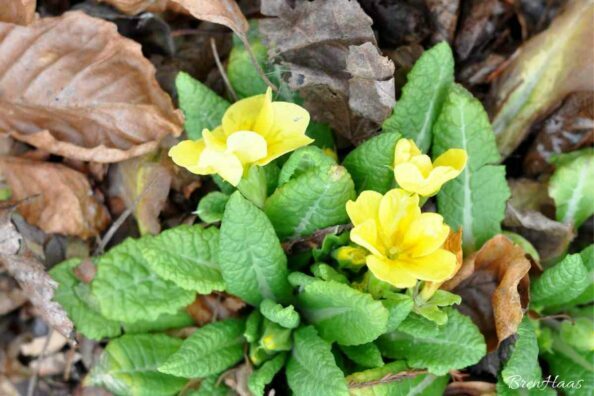 First to bloom in my garden is the perennial primrose – yellow. Soon to follow is the blue, pink and orange. 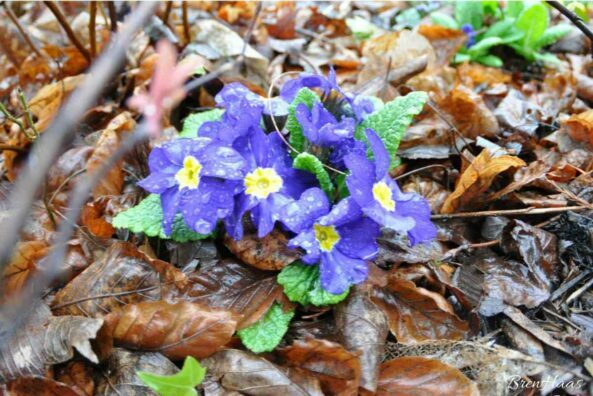 Each year my spring home garden is different just like the variety of weather. The home garden is filled with delightful and not so welcomed critters. It is excited to count over a dozen Praying Mantis castings back in the fruit tree garden of my home. Not so exciting to see bunnies playing in the landscape. Did you know that Female mantis will deposit their eggs in areas of your landscape like twigs then them with a foamy secretion? The secretion hardens and protects the eggs until they’re ready to hatch. My garden is filled with shades of brown but plenty of rich tons of color from Autumn that are starting to come back alive. 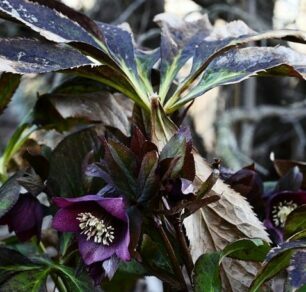 One of my favorites is under the variegated tree in my 6 year old shade garden where you will find this Hellebore. I’m in search of more colors of this perennial to add to this garden. 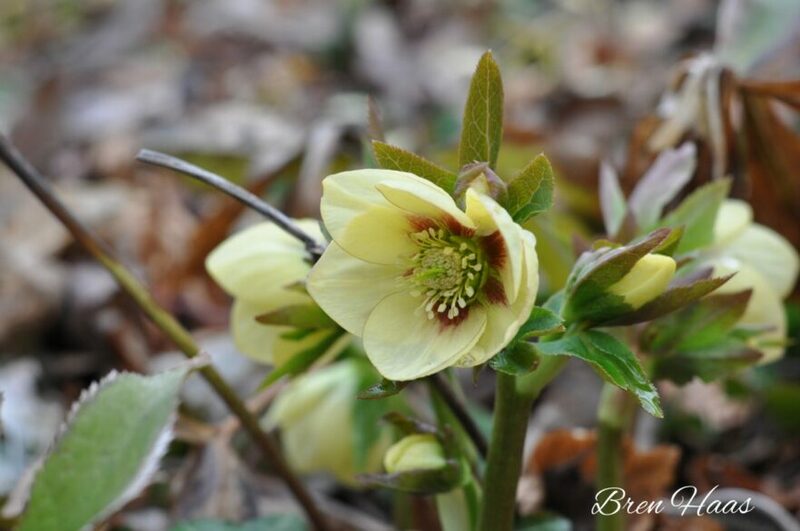 Please leave me a comment if you know of a garden center in NW Ohio or Michigan where I can pick up some Hellebore. This is the bloom that warms my 6-year-old garden during the first week of April. I’m looking forward to sharing more of my garden and home with you this Spring. What are you excited about this season? It’s funny how growing year-round makes me forget it is almost time to move containers outdoors. It’s exciting to think of all the flowers and shrubs that will soon be moved out of the greenhouse late spring and summer season. I usually play it safe and wait until the last week of May to bring most outdoors. I’m excited to learn more about your garden and share more experiences with you so be sure to comment below or visit my contact page on this website. Thank you for taking the time to stop by this Spring day. So strange… I can never “like” your posts! What am I excited for? GREEN!!! Today is a beautiful, sunshiny day which will really help in melting this blasted snow! What do you mean you ‘can never like ‘ my post – is the button funny? Let me know so I can try and fix it. The Like button is pale grey and it Loading…. but never does! Well… the sun is shining here big time AND the temperature is above freezing (yay!) so the snow, she be melting…. here’s hoping we can do the gardening thing on Victoria Day week-end as per usual! Good to know … thank you. I will try and fix it on my end Dale. I was outside most of the day here in Ohio. The bulbs are starting to bloom. I am late to the party but loved my visit even learnt something, I didn’t know what a praying mantis cocoon looked like! Pop over to my place and say hi!